Blog - The Ultimate Handheld Retro Gaming Tablet? The Ultimate Handheld Retro Gaming Tablet? The handheld gaming console market has exploded in recent times with the slew of Chinese-developed units invading our pockets. In the past these open and unlocked gaming handhelds didn't exactly set the world on fire, but they did fill a gap (certainly in terms of price), underneath the rival Sony Vita and Nintendo DS, as well as allowing unrestricted access to homebrew development. Now, though, things are a little different. Instead of the likes of the Dingoo OS and underpowered devices, we can enjoy some incredible Android based gaming on a very capable hardware base. The JXD S7800b is a flagship example of this modern handheld gaming boom. This 7" IPS LCD, five-point capacitive Android 4.2.2 based handheld features an impressive quad-core 1.6GHz Cortex A9 CPU and a Mali400 GPU. There's also 2GB of DDR3 memory, and it comes in both 8GB and 16GB flash storage versions. It's essentially a tablet, albeit a very elaborate one, and - as with virtually every other tablet available - it has WiFi, three axis accelerometer, front and rear cameras (0.3 and 2 Mega Pixels respectively), microSD card slot (with a maximum of 32GB), and a pair of stereo speakers. However, what makes this model different from a standard tablet is the fact that it's laden with buttons and joysticks. The JXD S7800b is a flagship example of the handheld gaming boom. There are two analogue sticks, a single D-pad, Start, Select, Home, control configuration and back buttons are located towards the bottom of the unit with a further four button arrangement conveniently placed at the right-hand thumb level. Two shoulder buttons on either side of the rounded edges of the unit increase the count to fourteen, and there's also a power and volume rocker on the left side of the unit. With this number of control buttons you're spoiled for choice when it comes to getting the most out of gaming, but it also leads to another issue: most Android-based games aren't designed for stick and button play. 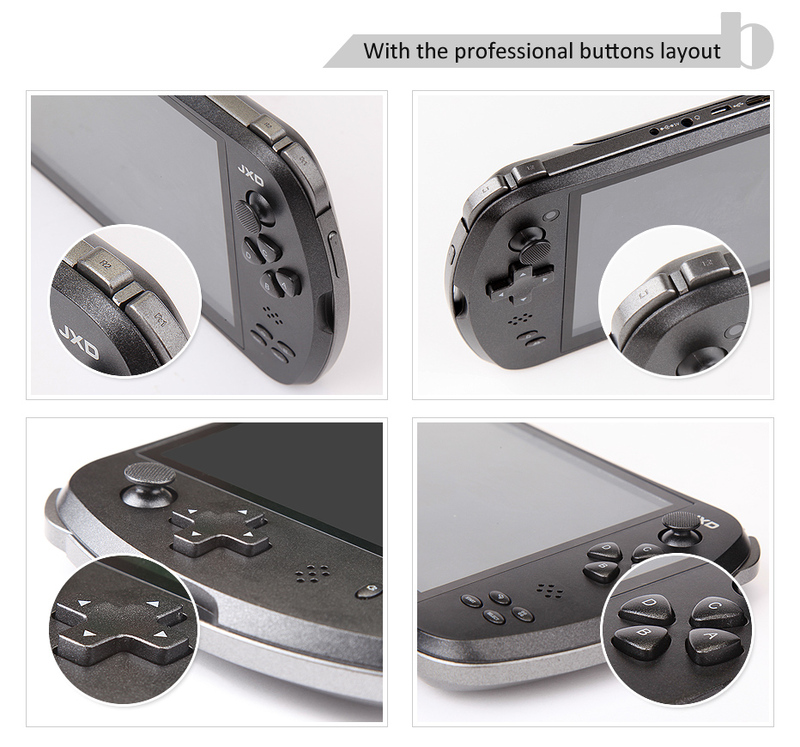 The JXD thankfully has an ace up its metaphorical sleeve, though, in the form of it configuration button. When this is pressed, usually in-game, a mask of the controls used by the game you're playing appears on screen, allowing you drag and drop the relevant physical controls to the choices in the game. So up, down, left, right, fire and so on on-screen can be paired with the sticks and buttons on the S7800b's case. 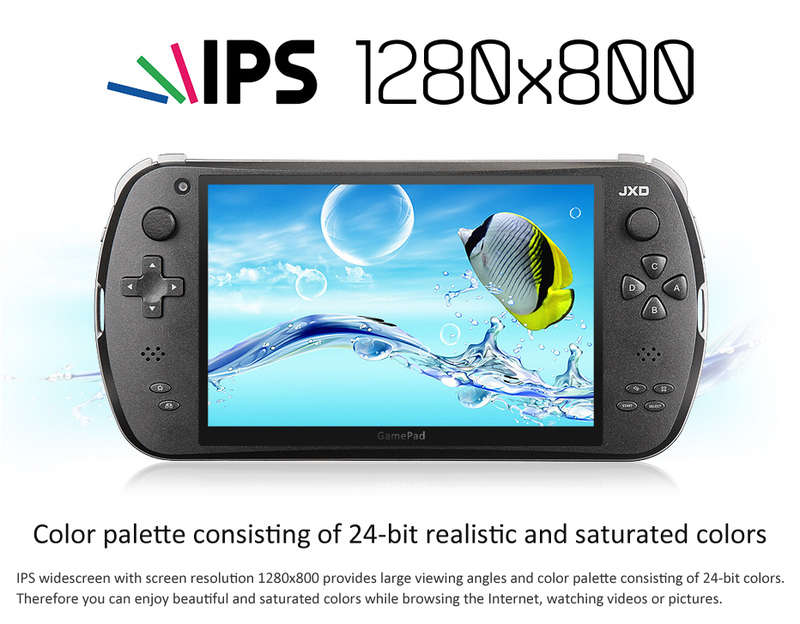 The design and aesthetics of the JXD S7800b are really very good, considering it's a mass-produced Chinese import. Usually these things reek of cheap and nasty plastic, but the S7800b is a well-built device that's solid and comfortable in the hand. Of course there are a few elements that could probably do with a bit of re-modelling, but on the whole it's a good setup. Where modern Android games are met with a certain lack of enthusiasm in some quarters, the JXD S7800B increases its appeal through being one of the best retro handheld consoles of modern times. As a part of the package you'll find already installed number of emulators, which will allow you play Sega Mega Drive, SNES, NES, PlayStation 1, CPS1/2 arcade coin-ops, and even N64 game ROMs. Through other Google Play Store installations it's also able to accurately emulate a DreamCast, ZX Spectrum, C64 and even DOS games.